That magic is no accident: Boss builds her circus from the bones out, molding a mechanical company that will survive the unforgiving landscape. But even a careful ringmaster can make mistakes. 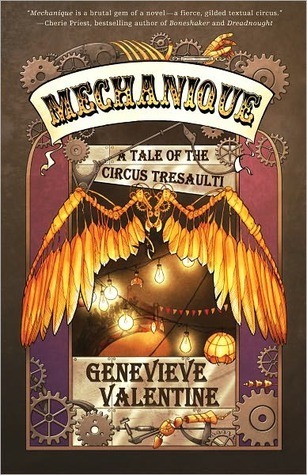 Mechanique is not just A Tale of the Circus Tresaulti, it’s also a study of the human condition. It presents us with a cast of characters that are half human and half machine and, like many themes in this novel, the question of “where does humanity end and machine begin?” is left to our interpretation. Is it the soul that makes a human? Is it the ‘aliveness’ of a body? Is it the ‘wholeness’ of that body? We never get a straight answer. Genevieve Valentine wrote her novel in a way that we only get glimpses at the characters lives, and through the short chapters and scenes we have to start patching up the whole story and getting our own answers. The Circus Tresaulti is home to some very interesting characters; there’s Panadrome who’s made entirely of metal but for his head, Ayar the strong man with a metal spine, Jonah the mechanical man whose back hatches open, Stennos and Bird whose act never gets an applause, the eight Grimaldi brothers, the aerialists led by Elena with Big Tom and Big George as living trapezes, and Alec the winged man. The circus and the performer are enchanting, but there’s the feeling that something is inherently wrong with all of it. The descriptions have a grotesque feel to them, focusing on the metal parts; the copper bones and how they work, sound, and look against their bodies. The performers are outcasts in the world and inside the circus as well; there’s a clear division between “the ones with the bones” and the others. This is the life they chose when they asked Boss to get the mechanical parts into their bodies. They’re outcasts because they’re half machines, but does this mean they stop being human? For me, the answer was no until I got to the later parts of the story. When I learned the mechanics of how Boss works her magic, I wasn’t so sure of my clear-cut answer anymore. Panadrome is the first one Boss builds (Valentine 114-115). The bomb explosion obliterates his body and all that’s left is his head. He’s effectively dead, but she still brings him back. It’s then I saw Boss as a necromancer. When she implants the mechanical parts into the performers’ bodies, she kills them first and then reanimates their bodies. The only thing keeping them alive from then on is her magic. Now, does the death of their bodies mean they stop being human? I don’t think so. Part of Boss’s ability is holding onto the souls of the dead, though the word soul is never used. It’s the reason why the performers retain their personalities when she reanimates them. But their bodies remain clinically dead. We see this when little George comforts Ying with a hug and he remarks that her tears were warm but “the rest of her was cold as the grave” (Valentine 150). In the following page, Boss describes her creations as having “an armor skeleton with a human wrapped around it” (Valentine 151). But it’s not as simple as that. Elena’s body might be dead, but she can still sense her old bones inside Alec’s wings (Valentine 145, 161). Does it mean part of her soul stayed in the old bones, or that her soul recognizes a piece is missing from her? This brings on the idea that body and soul can’t be separated without consequences. Another line that brings up the question of the performers’ humanity is when the narrator asks, “How could you hurt someone who had a knot of metal where a heart should be?” (Valentine 198). This infers that they can’t feel without a heart. But their bodies are already dead, meaning that even with a flesh and blood heart, it wouldn’t work. Yet the performers still feel. Elena feels anger, Jonah feels fear, and at one point Bird feels attracted to Stennos. In the end, my conclusion is that the performers of the Circus Tresaulti aren’t human anymore. The process that Boss puts them through makes them into something more; they’re stronger, faster, and live longer. They’re only separated from that human side of them. But the people in the story don’t see it that way. The government man says to Boss, “It was a mistake to leave them human…I was disappointed to see they can bleed” (Valentine 186). For him, it’s the body that makes the performers human. It would’ve been interesting for him to meet Panadrome, who is fully metal except for the head. What would he have thought then? However, being human includes other aspects aside from a body, like having a soul. Like I said, the word is never used in the text. Let’s just say it’s the thing that holds on to their personalities, memories, and emotions. If they didn’t have these then they’d be mindless machines. Getting the copper bones and turning into half-machines doesn’t take away their souls, their humanity. After all, having a full human body doesn’t guarantee anything. Cruelty and viciousness can erase all traces of humanity from someone.